In common with all of India, Delhi has numerous religious and secular festivals throughout the year. Many of the religious festivals depend on traditional calendars and so have moveable dates corresponding to the de lunar cycle. 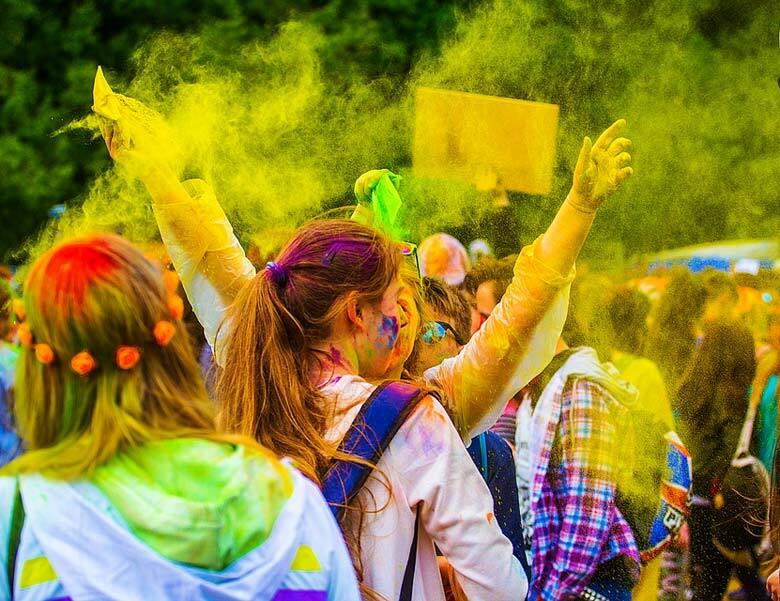 A selection of the best-known festivals follows below. but is there are many more local ones. The biggest crowd-puller of all is the annual Republic Day parade on 26 January, when hundreds of thousands of people line Raj Path to watch a procession of soldiers and tanks, camel corps and the cavalry regiments, brass bands and traditional dancers. School children and freedom fighters. On the 29 January, the Republic Day festivities in are brought to an end with the Beating the Retreat, a parade of India’s armed forces and military bands. Following this is the Surajkund Crafts Mela, held for a month in February at Surajkund, the 10th-century ruin of a sun temple, on the outskirts of Delhi. Artisans from all over India camp here for a month, making and selling their goods. 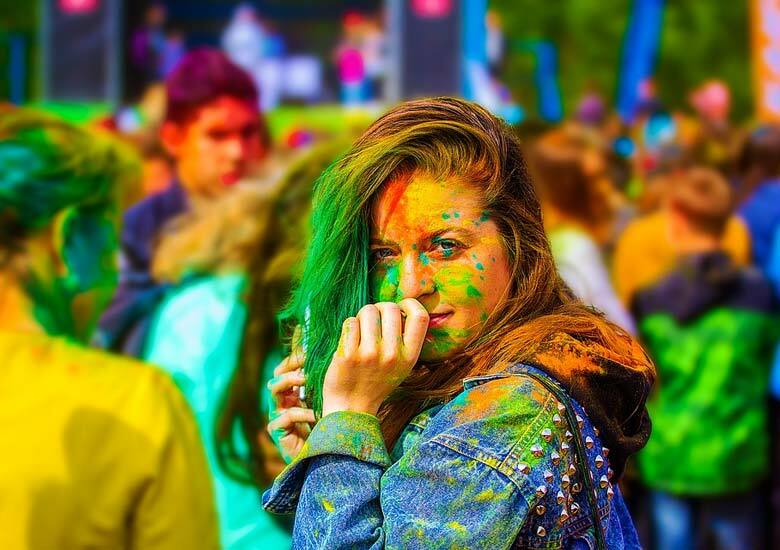 The spring festival of Holi occurs at the full moon between February and March. This is a time when social restraint breaks down, people cover each other with coloured powder and there is widespread consumption of bhang (cannabis). This is also a time for visitors, especially women, to be wary of going outside as the revelry often gets out of hand. Shivaratri, the night when Shiva is said to have performed his comic dance (tandava), falls at the end of February/ beginning of March. New Year in North India falls in the Hindu month of Vaisakha (April—May), and is celebrated by the festival of Vaisakhi. This is an important day for Sikhs and it is traditionally celebrated in the Punjab by the dancing of bhangra, accompanied by large drums known as dhol. At around this time the Muslim festival Of Id-ule-Fitr often falls (although Id can occur much earlier or later in the year). This marks the end of the month-long fast of Ramadan. This is also the time of the Urs of the Chisti saint, Nizamuddin. Another Muslim festival that depends on the lunar calendar, and is therefore movable, is Muharram. This is the period when Shi’a Muslims commemorate the martyrdom of the Prophet’s grandson, Hussain. Processions of devotees carrying large, decorated tazias (representations of Hussain’s tomb at Karbala) move through the streets and many followers beat themselves with chains in grief. 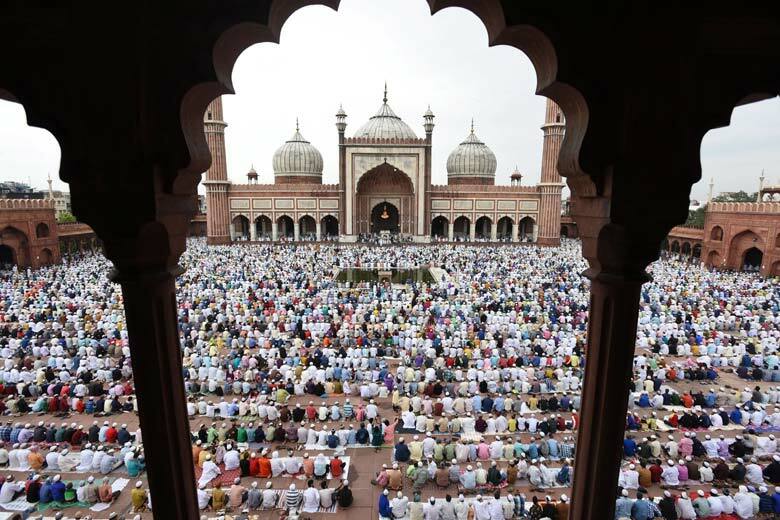 The third great Muslim festival of the year is Bakr Id, which usually falls later in the year. This commemorates Ibrahim’s sacrifice of his son, and traditionally a goat is sacrificed and eaten on this day. Independence Day (15 August) is a national holiday. In Delhi, the Prime Minister speaks from the ramparts of the Red Fort and the Indian flag is hoisted on the Lahore Gate. 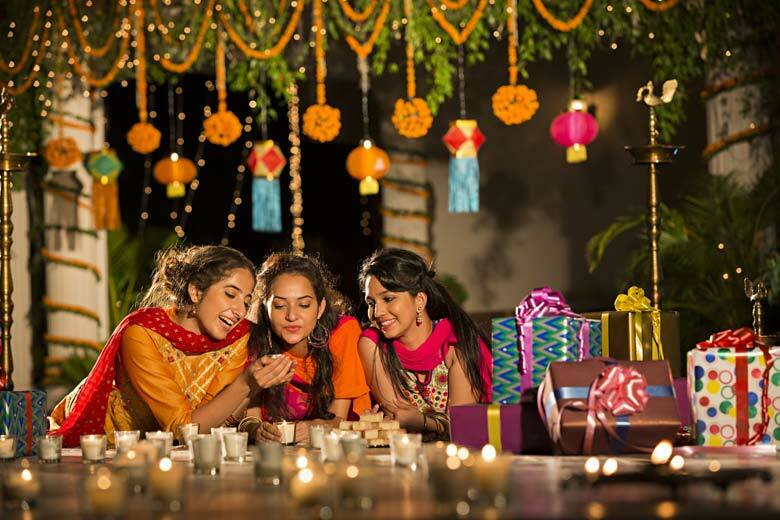 The Hindu festival of Raksha-bandhan also occurs around this time. Sisters pray for their brothers before tying silk threads around their brothers’ wrists. In return a brother will give his sister a small gift and promise to look after and protect her. 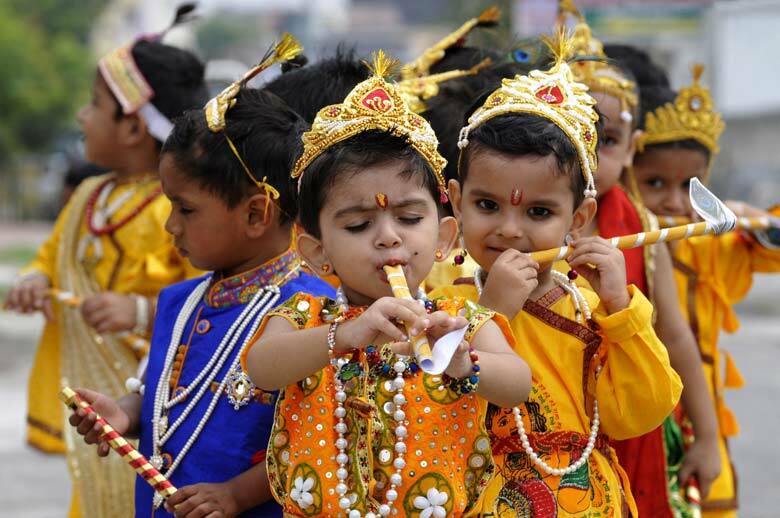 Later in August the festival of Janamashtami which celebrates the birth of Lord Krishna is the occasion for dance-dramas known as ras-lilas, which enact scenes from Krishna’s life. A festival unique to Delhi occurs in early October, the Phul-walon-ki-Sair (the flower-sellers’ procession), celebrated in Mehrauli in South Delhi. A few weeks later comes Dussehra, in October, celebrated with particular gusto in Delhi. This is traditionally the time when the ram-lila (lance-drama is performed. throughout the month, with episodes from the great epic, the Ramayana, telling the dramatic story of the god Rama and his battle with the king of Lanka, Ravana. Dussehra is followed in November by Divali, the festival of lights, when an enchanting Divali Mela (fair) is held in the Mughal Talkatora gardens. The festival celebrates Rama’s return to Ayodhya after his 14 year exile, lamps are lit and fireworks set off. This is also when doors are left open to invite the goddess of wealth, Lakshmi, into people’s homes. The most important festival of the year for Delhi’s Sikh community is Guru Nanak Jayanti, the commemoration of the birth of the first Sikh Guru. It is marked by processions and the reading of the Sikhs’ holy book, the Guru Granth Sahib. Christmas Day is celebrated by India’s Christians, and both it and New Year’s Day are marked by a public holiday in India. 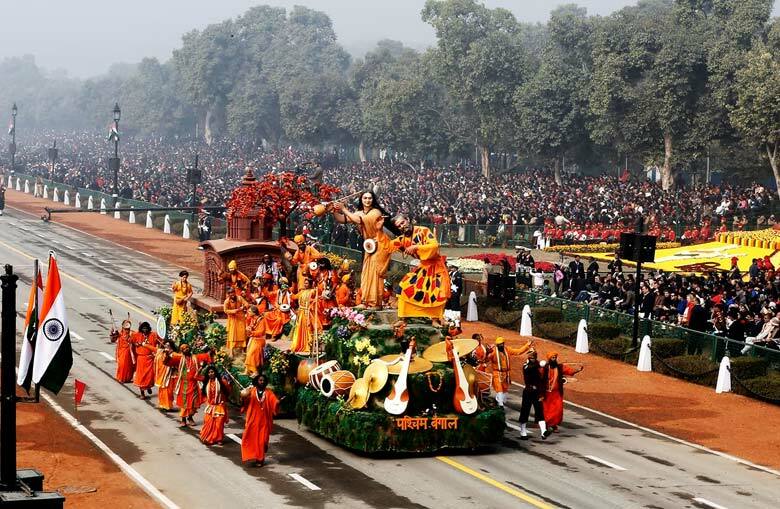 For more information on Festivals in Delhi and Delhi Sightseeing Tour by Car Contact Swan Tours one of the leading travel agents in India.